Get excited. You are invited to the launch of Canberra’s biggest ever infrastructure project - Gungahlin to City light rail. Be prepared as facilities at stops are limited. We have more room for you to wait and will let most people on at the City or Gungahlin. Be part of the community launch day on Saturday 20 April from 9am to 4pm. Large crowds and queues are expected - we will move people through the queues as quickly and safely as possible. Follow the directions of traffic marshals and security at all times. You won’t need a MyWay card for light rail on the Saturday or Sunday. ALL PASSENGERS WILL BE REQUIRED TO DISEMBARK the Terminus, or at a stop along the alignment to give other people a chance to get on. You will be welcome to ride again after rejoining the queue or be assisted with other transport options to return to your starting location. 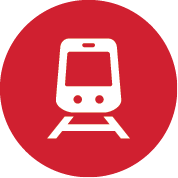 Transport Canberra staff in red hats and red shirts will be available to help you experience light rail, welcome you to the event, find something fun to do, find any facilities you need or help you with transport options. Visit the Transport Canberra Information Tent in the City and Gungahlin Place to learn about the New Network, City to Woden light rail, Canberra’s future light rail network, extensive cycle paths and our dockless bike system. BBQ supporting a local charity Hands Across Canberra at the city stop. Local charity, Hands Across Canberra will be taking gold coin donations at the light rail termini to raise funds for community service organisations working with Canberra’s most vulnerable individuals and families. No bikes are allowed on board on the launch day - ride your bike, but you will need to lock it up at the City or Gungahlin Interchange. Gungahlin Place will also be closed during the event to allow crowds to safely use light rail. We are finalising regular and additional bus services that will be available on launch day. All stops will be open and operating with queues managed from the City and Gungahlin Place where you are more likely to get a place onboard. Help reduce road congestion and the demand for parking, consider Park & Ride. Park your car and then hop on a free bus to the City or Gungahlin Place. On Easter Sunday 21 April – Free travel across the network on light rail and buses, but no celebrations. On Easter Monday 22 April – Paid passenger services and public holiday timetable, then normal services for the rest of the week. The entire new transport network of bus and light rail will be free for a month from 29 April to 26 May 2019 for MyWay card holders.